Bad summer blockbuster movie detected: Commence Termination! Sometimes, the sequel can be better than the original (case in point: Spiderman 2). Not Transformers: Revenge of the Fallen. The first film was at least fun. In the 2nd installment, the humor is forced, the plot uninteresting. I was frankly falling asleep even during the intense action scenes. Shia Labeouf, Megan Fox, Josh Duhamel, Julie White, Kevin Dunn and John Turturro are back for this too-long, noisy sequel. John Benjamin Hickey (we saw him recently as the Earl of Leicester in the play Mary Stuart) is the usual government bad guy who just won't let our leads do what they're supposed to do. The new twin autobots Mudflap and Skids are the Jar Jar Binks of this movie. Any pluses? I still love the actors who voiced the robots (Peter Cullen as Optimus Prime and Hugo Weaving as Megatron), the idea of an aging defector Decepticon (Jetfire) complete with beard and walking stick. And now I can tell the Autobots and Decepticons apart during their fight scenes. 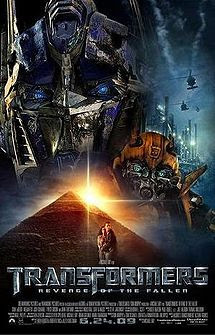 It's still cool to see the Transformers umm..transform. Despite its faults, I'm sure it will continue to make money. And Michael Bay can continue doing what he does best: blow up stuff and make plenty of noise.